To fix the canopy over the crib easy. You can use a universal frame or a makeshift frame of thick wire. The fabric is fixed by rings, hooks or tapes. - tools and devices for mounting the frame above the crib. Fabricate a metal frame for the canopy. To do this, fold a thick smooth wire in the form of the letter P or in semicircle. Slip into the frame rings or hooks, to which is attached a fabric canopy. Hang the frame over the center of the cot. Attach the rings or hooks of the frame of the canvas canopy. Gently spread the folds of the fabric. Attach the frame over the crib with the utmost care. Otherwise the frame could fall on a child and injure him. The canopy not only performs a decorative function, bringing comfort to the interior of the nursery. The fabric hides from prying eyes the crib, creates protection from bright sunlight, which provides, in turn, rest a baby during a NAP. In addition, the canopy keeps dust, not allowing her to get the baby. 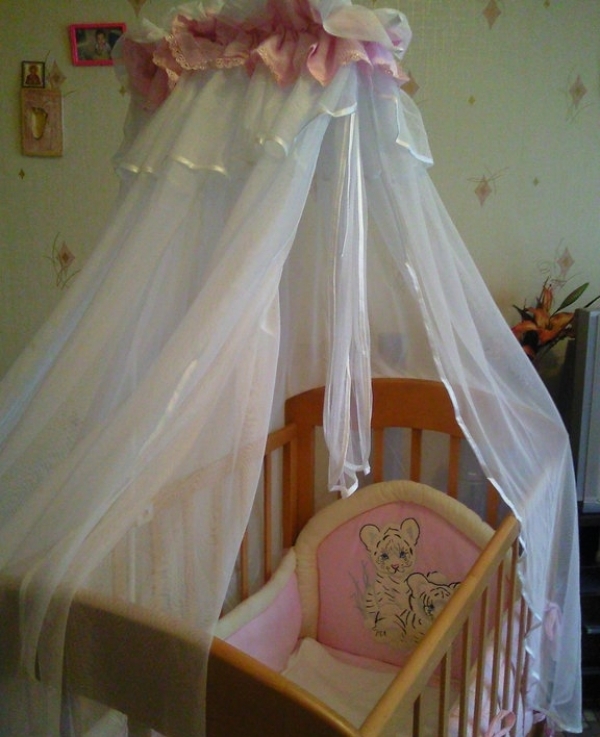 To avoid sliding off the canopy with hooks or rings and drop it on the baby, use a better method of fastening tissue. For this purpose, the inner side of the fabric sew wide strips of fabric. Insert in the pockets of beautiful colored ribbon, and then tie up these colorful elements on the frame. Distribute the nodes evenly, and tape unroll. It will give the aesthetics and reliability of the design. To secure the canopy you can use ready-made brackets. Instructions for fixing them on the fabric, usually attached to the product. Such universal brackets, fit any cot. They are mounted on the back side bars or top/bottom bracket crib.